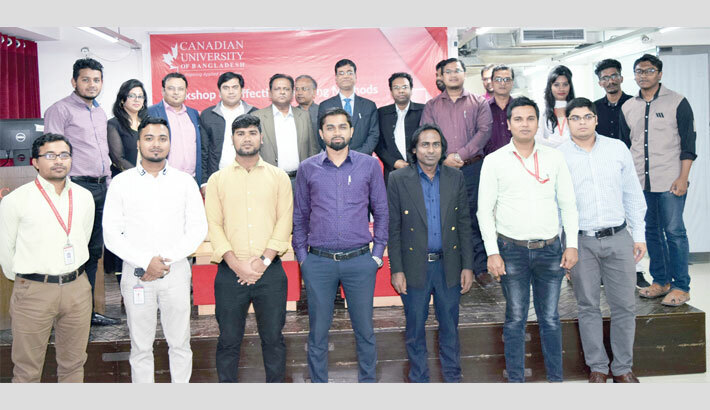 School of Business of Canadian University of Bangladesh (CUB) organised a workshop on ‘Effective Teaching Methods’ at the university auditorium in the capital on Tuesday. Dr Md Aminul Islam, Associate Professor of School of Business and Technopreneurship Universiti Malayasia Perlis, was the resource person in the workshop, says a press release. Prof Dr Nazrul Islam, Pro-Vice Chancellor of Canadian University of Bangladesh, presided over the programme while SM Arifuzzaman, Head, School of Business, conducted the event. Among others, Dr Abdullah-Al-Monzur Hussain, Head, School of Law, Dr Nurul Islam Babul, Head, Department of Film and TV, Capt Kazi Ali Imam, Head Department of Shipping & Maritime Science (SMS), Dr Mohammad Shahrukh Adnan Khan, Head, EEE Department and Nuzhat Afrin, Lecturer, Department of English, attended the workshop.